This article is about present tensions between the East and West. For the 2016 film, see Cold War 2 (film). For other uses, see Cold War II (disambiguation). Past sources, such as academics Fred Halliday, Alan M. Wald, and David S. Painter, used the interchangeable terms to refer to the 1979–1985 and/or 1985–1991 phases of the Cold War. Some other sources used interchangeable terms to refer to the Cold War of the mid-1970s. Columnist William Safire argued in a 1975 New York Times editorial that the Nixon administration's policy of détente with the Soviet Union had failed and that "Cold War II" was now underway. Academic Gordon H. Chang in 2007 used the term "Cold War II" to refer to the Cold War period after the 1972 meeting in China between US President Richard Nixon and Chinese Chairman Mao Zedong. In 1998, George Kennan called the US Senate vote to expand NATO to include Poland, Hungary, and the Czech Republic as "the beginning of a new cold war", and predicted that "the Russians will gradually react quite adversely and it will affect their policies". The journalist Edward Lucas wrote his 2008 book The New Cold War: How the Kremlin Menaces both Russia and the West, claiming that a new cold war between Russia and the West had begun already. Sources disagree as to whether a period of global tension analogous to the Cold War is possible in the future, while others have used the term to describe the ongoing renewed tensions, hostilities, and political rivalries that intensified dramatically in 2014 between Russia and its allies and the United States and its allies. Michael Klare, a RealClearPolitics writer and an academic, in June 2013 compared tensions between Russia and the West to the ongoing proxy conflict between Saudi Arabia and Iran. Oxford Professor Philip N. Howard argued that a new cold war was being fought via the media, information warfare, and cyberwar. In 2014, notable figures such as Mikhail Gorbachev warned, against the backdrop of a confrontation between Russia and the West over the Ukrainian crisis, that the world was on the brink of a new cold war, or that it was already occurring. The American political scientist Robert Legvold also believes it started in 2013 during the Ukraine crisis. Others argued that the term did not accurately describe the nature of relations between Russia and the West. Stephen F. Cohen, Robert D. Crane, and Alex Vatanka have all referred to a "US–Russian Cold War". Andrew Kuchins, an American political scientist and Kremlinologist speaking in 2016, believed the term was "unsuited to the present conflict" as it may be more dangerous than the Cold War. While new tensions between Russia and the West have similarities with those during the Cold War, there are also major differences, such as modern Russia's increased economic ties with the outside world, which may potentially constrain Russia's actions, and provide it with new avenues for exerting influence, such as in Belarus and Central Asia, which have not seen the type of direct military action that Russia engaged in less cooperative former Soviet states like Ukraine and the Caucasus region. The term "Cold War II" has therefore been described as a misnomer. The term "Cold War II" gained currency and relevance as tensions between Russia and the West escalated throughout the 2014 pro-Russian unrest in Ukraine followed by the Russian military intervention and especially the downing of Malaysia Airlines Flight 17 in July 2014. By August 2014, both sides had implemented economic, financial, and diplomatic sanctions upon each other: virtually all Western countries, led by the US and European Union, imposed punitive measures on Russia, which introduced retaliatory measures. Some observers − including Syrian President Bashar al-Assad − judged the Syrian Civil War to be a proxy war between Russia and the United States, and even a "proto-world war". In January 2016, senior UK government officials were reported to have registered their growing fears that "a new cold war" was now unfolding in Europe: "It really is a new Cold War out there. Right across the EU we are seeing alarming evidence of Russian efforts to unpick the fabric of European unity on a whole range of vital strategic issues". In an interview with Time magazine in December 2014, Gorbachev said that the US under Obama was dragging Russia into a new cold war. In February 2016, at the Munich Security Conference, NATO Secretary General Jens Stoltenberg said that NATO and Russia were "not in a cold-war situation but also not in the partnership that we established at the end of the Cold War", while the Russian Prime Minister, Dmitry Medvedev, speaking of what he called NATO's "unfriendly and opaque" policy on Russia, said "One could go as far as to say that we have slid back to a new Cold War". In October 2016 and March 2017, Stoltenberg said that NATO did not seek "a new Cold War" or "a new arms race" with Russia. In February 2016, a National Research University academic and Harvard University visiting scholar Yuval Weber wrote on E-International Relations that "the world is not entering Cold War II", asserting that the current tensions and ideologies of both sides are not similar to those of the original Cold War, that situations in Europe and the Middle East do not destabilize other areas geographically, and that Russia "is far more integrated with the outside world than the Soviet Union ever was". In September 2016, when asked if he thought the world had entered a new cold war, Russian Foreign Minister, Sergey Lavrov, argued that current tensions were not comparable to the Cold War. He noted the lack of an ideological divide between the United States and Russia, saying that conflicts were no longer ideologically bipolar. In October 2016, John Sawers, a former MI6 chief, said he thought the world was entering an era that was possibly "more dangerous" than the Cold War, as "we do not have that focus on a strategic relationship between Moscow and Washington". Similarly, Igor Zevelev, a fellow at the Wilson Center, said, "[I]t's not a Cold War [but] a much more dangerous and unpredictable situation". CNN opined, "It's not a new Cold War. It's not even a deep chill. It's an outright conflict". In January 2017, a former US Government adviser Molly K. McKew said at Politico that the US would win a new cold war. The New Republic editor Jeet Heer dismissed the possibility as "equally troubling[,] reckless threat inflation, wildly overstating the extent of Russian ambitions and power in support of a costly policy", and too centred on Russia while "ignoring the rise of powers like China and India". Heer also criticized McKew for suggesting the possibility. Jeremy Shapiro, a senior fellow in the Brookings Institution, wrote in his blog post at RealClearPolitics, referring to the US–Russia relations: "A drift into a new Cold War has seemed the inevitable result". In August 2017, Russian Deputy Foreign Minister Sergei Ryabkov denied claims that the US and Russia were having another cold war, despite ongoing tensions between the two countries and newer US sanctions against Russia. In March 2018, Russian President Vladimir Putin told journalist Megyn Kelly in an interview, "My point of view is that the individuals that have said that a new Cold War has started are not analysts. They do propaganda." Michael Kofman, a senior research scientist at the CNA Corporation and a fellow at the Wilson Center's Kennan Institute said that the new cold war for Russia "is about its survival as a power in the international order, and also about holding on to the remnants of the Russian empire". Lyle Goldstein, a research professor at the US Naval War College claims that the situations in Georgia and Ukraine "seemed to offer the requisite storyline for new Cold War". In March 2018, Harvard University professors Stephen Walt and then Odd Arne Westad criticized the term usage as reference to increasing tensions between the Russia and the West as "misleading", "distract[ing]", and too simplistic to describe the more complicated contemporary international politics. Amidst the deterioration of relations between both sides over a potential US-led military strike in Middle East after the Douma chemical attack in Syria and poisoning of the Skripals in the UK, the Secretary-General of the United Nations, Antonio Guterres, told a meeting of the UN Security Council in April 2018 that "the Cold War was back with a vengeance". He suggested the dangers were even greater, as the safeguards that existed to manage such a crisis "no longer seem to be present". Dmitri Trenin supported Guterres' statement, but added that it began in 2014 and had been intensifying since, resulting in US-led strikes on the Syrian government on 13 April 2018. Russian news agency TASS reported the Russian Foreign Minister Sergei Lavrov saying, "I don't think that we should talk about a new Cold War", adding that the US development of low-yield nuclear warheads (the first of which entered production in January 2019) had increased the potential for the use of nuclear weapons. TASS further reported Sergei stating that the withdrawal from the INF treaty would not lead to "a new Cold War". The U.S. senior defense official Jed Babbin, Yale University professor David Gelernter, Firstpost editor R. Jagannathan, Subhash Kapila of the South Asia Analysis Group, former Australian Prime Minister Kevin Rudd, and some other sources have used the term (occasionally using the term the Pacific Cold War) to refer to tensions between the United States and China in the 2000s and 2010s. Talk of a "new Cold War" between a United States-led block of countries on the one hand and the putative Beijing-Moscow axis, including explicit references to it in the official PRC′s media, intensified in the summer of 2016 as a result of the territorial dispute in the South China Sea, when China defied the Permanent Court of Arbitration′s ruling against China on the South China Sea dispute, and the U.S. announcing in July 2016 it would deploy the Terminal High Altitude Area Defence (THAAD) in South Korea, a move resented by China as well as Russia and North Korea. Donald Trump, who was inaugurated as US president on 20 January 2017, had repeatedly said during his presidential campaign that he considered China a threat, a stance that heightened speculations of the possibility of a "new cold war with China". Claremont McKenna College professor Minxin Pei said that Trump's election win and "ascent to the presidency" may increase chances of the possibility. In March 2017, a self-declared socialist magazine Monthly Review said, "With the rise of the Trump administration, the new Cold War with Russia has been put on hold", and also said that the Trump administration has planned to shift from Russia to China as its main competitor. In July 2018, Michael Collins, deputy assistant director of the CIA's East Asia mission center, told the Aspen Security Forum in Colorado that he believed China under paramount leader Xi Jinping, while unwilling to go to war, was waging a "quiet kind of cold war" against the United States, seeking to replace the U.S. as the leading global power. He elaborated: "What they're waging against us is fundamentally a cold war — a cold war not like we saw during THE Cold War (between the U.S. and the Soviet Union) but a cold war by definition." In October 2018, a Hong Kong's Lingnan University professor Zhang Baohui told The New York Times that a speech by United States Vice President Mike Pence at the Hudson Institute "will look like the declaration of a new Cold War." In January 2019, Robert D. Kaplan of the Center for a New American Security wrote: "it is nothing less than a new cold war: The constant, interminable Chinese computer hacks of American warships’ maintenance records, Pentagon personnel records, and so forth constitute war by other means. This situation will last decades and will only get worse". In February 2019, Joshua Shifrinson, an associate professor from Boston University, criticized the concerns about tensions between China and the US as "overblown", saying that the relationship between the two countries are different from that of the US–Soviet Union relations during the original Cold War, that factors of heading to another era of bipolarity are uncertain, and that ideology play a less prominent role between China and the US. ^ Dmitri Trenin (4 March 2014). "Welcome to Cold War II". Foreign Policy. Graham Holdings. Archived from the original on 28 January 2015. Retrieved 4 February 2015. ^ Kozloff, Nikolas (15 October 2015). "As Cold War II Looms, Washington Courts Nationalist, Rightwing - Catholic, Xenophobic Poland". Huffington Post. Archived from the original on 19 October 2017. Retrieved 26 February 2019. ^ Simon Tisdall (19 November 2014). "The new cold war: are we going back to the bad old days?". The Guardian. Guardian News and Media Limited. Archived from the original on 6 February 2015. Retrieved 4 February 2015. ^ a b Philip N. Howard (1 August 2012). "Social media and the new Cold War". Reuters. Reuters Commentary Wire. Archived from the original on 19 October 2017. Retrieved 2 August 2016. ^ Bovt, George (31 March 2015). "Who Will Win the New Cold War?". The Moscow Times. Archived from the original on 8 December 2015. Retrieved 28 January 2016. ^ Mackenzie, Ryan (3 October 2015). "Rubio: U.S. 'barreling toward a second Cold War'". The Des Moines Register. USA Today. Archived from the original on 27 January 2016. Retrieved 28 January 2016. ^ Trenin, Dmitri (2 March 2014). "The crisis in Crimea could lead the world into a second cold war". The Guardian. Archived from the original on 20 January 2016. Retrieved 28 January 2016. ^ Powell, Bill (29 May 2015). "A New Cold War, Yes. But It's With China, Not Russia". Newsweek.com. Newsweek. Archived from the original on 8 July 2016. Retrieved 21 April 2016. ^ Scott, David (2007). China Stands Up: The PRC and the International System. Routledge. pp. 79–81. ISBN 978-0415402705. LCCN 2006038771 – via Amazon.com. ^ Christie, Daniel J.; Beverly G. Toomey (1990). "The Stress of Violence: School, Community, and World". In L. Eugene Arnold; Joseph D. Noshpitz. Childhood Stress. New York City: John Wiley & Sons. p. 305. ISBN 978-0471508687. Retrieved 20 January 2017 – via Google Books. ^ van Dijk, Ruud, ed. (2007). Encyclopedia of the Cold War. Taylor & Francis Group. ISBN 978-0-415-97515-5. LCCN 2007039661. Retrieved 18 March 2018. ^ Halliday, Fred (1989). "The Making of the Cold". The Making of the Second Cold War (2nd ed.). Verso Books. ISBN 978-0860911449. Retrieved 20 January 2017 – via Google Books. ^ Edwards, Paul N. (1996). "Computers and Politics in Cold War II". The Closed World: Computers and the Politics of Discourse in Cold War America. Massachusetts Institute of Technology. p. 276. ISBN 9780262550284. Retrieved 20 January 2017 – via Google Books. ^ Wald, Alan M. (1987). The New York Intellectuals: The Rise and Decline of the Anti-Stalinist Left From the 1930s to the 1980s. University of North Carolina Press. pp. 344, 347. ISBN 978-0807841693. Retrieved 20 January 2017 – via Google Books. ^ Painter, David S. (1999). 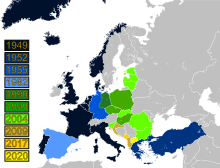 "The Rise and Fall of the Second Cold War, 1981–91". The Cold War: An International History. Routledge. pp. 95–111. ISBN 978-0-415-19446-4. ^ Richard Devetak; Jim George; Sarah Percy, eds. (2017). "Chapter 10: The Cold War and After". An Introduction to International Relations (3rd ed.). Cambridge University Press. p. 161. ^ Smith, Joseph; Simon Davis (2017). "Introduction". Historical Dictionary of the Cold War (2nd ed.). ISBN 9781442281851. LCCN 2016049707. ^ Safire, William (29 December 1975). "Cold War II". The New York Times. Archived from the original on 14 March 2018. Retrieved 13 March 2018. ^ Chang, Gordon H. (June 2008). "Review: Nixon in China and Cold War I and Cold War II". Diplomatic History. 32 (3): 493–496. JSTOR 24915887. ^ Friedman, Thomas L. (2 May 1998). "Foreign Affairs; Now a Word From X". The New York Times. Archived from the original on 13 March 2018. Retrieved 13 March 2018. ^ Review of The New Cold War by Edward Lucas Archived 25 January 2017 at the Wayback Machine. BBC. 12 February 2008. Retrieved 11 June 2017. ^ Pavel Koshkin (25 April 2014). "What a new Cold War between Russia and the US means for the world". Archived from the original on 16 November 2015. Retrieved 11 November 2015. ^ Rojansky & Salzman, Matthew & Rachel S (20 March 2015). "Debunked: Why There Won't Be Another Cold War". The National Interest. The National Interest. Archived from the original on 6 March 2016. Retrieved 25 February 2016. ^ Lawrence Solomon (9 October 2015). "Lawrence Solomon: Cold War II? Nyet". ^ "Welcome to Cold War II". Foreign Policy. 4 March 2014. Archived from the original on 9 November 2014. Retrieved 10 November 2014. ^ Klare, Michael (1 June 2013). "Welcome to Cold War II". Tom Dispatch. RealClearWorld. Archived from the original on 15 February 2017. Retrieved 20 December 2016. ^ Conant, Eve (12 September 2014). "Is the Cold War Back?". National Geographic. Archived from the original on 20 December 2014. Retrieved 19 December 2014. ^ Malyarenko, Tatyana; Stefan Wolff (15 February 2018). "The logic of competitive influence-seeking: Russia, Ukraine, and the conflict in Donbas". Post-Soviet Affairs. 34 (4): 191–212. doi:10.1080/1060586X.2018.1425083. ^ Kendall, Bridget (12 November 2014). "Rhetoric hardens as fears mount of new Cold War". BBC News. Archived from the original on 18 January 2015. Retrieved 20 December 2014. ^ Freedman, Lawrence (14 March 2018). "Putin's new Cold War". New Statesman. Archived from the original on 14 March 2018. Retrieved 15 March 2018. ^ Robert Legvold on the New Cold War, Interview with Columbia University Professor and Leading Russia Scholar Archived 1 January 2017 at the Wayback Machine 10 November 2015. ^ Bremmer, Ian (29 May 2014). "This Isn't A Cold War. And That's Not Necessarily Good". Time. Archived from the original on 13 January 2015. Retrieved 19 December 2014. ^ Walt, Stephen (12 March 2018). "I Knew the Cold War. This Is No Cold War". Foreign Policy. Archived from the original on 19 March 2018. Retrieved 18 March 2018. ^ Cohen, Stephen F. (14 February 2018). "If America 'Won the Cold War,' Why Is There Now a 'Second Cold War with Russia'?". The Nation. Archived from the original on 1 April 2018. Retrieved 1 April 2018. ^ Crane, Robert D. (12 February 2015). "Psychostrategic Warfare and a New U.S.-Russian Cold War". The American Muslim (Tam). Archived from the original on 16 March 2015. Retrieved 1 April 2018. ^ Vatanka, Alex (16 August 2016). "Russian Bombers in Iran and Tehran's Internal Power Struggle". The National Interest. Archived from the original on 1 April 2018. Retrieved 1 April 2018. ^ Elevation and Calibration: A New Russia Policy for America Archived 13 December 2016 at the Wayback Machine: II. The Current Impasse: Not a New Cold War but Potentially More Dangerous, Center on Global Interests, December 2016, p. 9–12. ^ Stewart, James (7 March 2014). "Why Russia Can't Afford Another Cold War". The New York Times. Archived from the original on 1 December 2014. Retrieved 3 January 2015. ^ "Putin's 'Last and Best Weapon' Against Europe: Gas". 24 September 2014. Archived from the original on 6 January 2015. Retrieved 3 January 2015. ^ "U.S. and other powers kick Russia out of G8". CNN.com. 25 March 2014. Archived from the original on 8 August 2014. Retrieved 7 August 2014. ^ Johanna Granville, "The Folly of Playing High-Stakes Poker with Putin: More to Lose than Gain over Ukraine Archived 13 March 2015 at the Wayback Machine". 8 May 2014. ^ "'The Cold War never ended...Syria is a Russian-American conflict' says Bashar al-Assad". The Telegraph. 14 October 2016. Archived from the original on 1 February 2017. Retrieved 24 January 2017. ^ "U.S. Weaponry Is Turning Syria Into Proxy War With Russia". The New York Times. 12 October 2015. Archived from the original on 15 October 2015. Retrieved 14 October 2015. ^ "U.S., Russia escalate involvement in Syria". CNN. 13 October 2015. Archived from the original on 17 October 2015. Retrieved 17 October 2015. ^ "Untangling the Overlapping Conflicts in the Syrian War". The New York Times. 18 October 2015. Archived from the original on 19 October 2015. Retrieved 19 October 2015. ^ "Russia accused of clandestine funding of European parties as US conducts major review of Vladimir Putin's strategy / Exclusive: UK warns of 'new Cold War' as Kremlin seeks to divide and rule in Europe". The Daily Telegraph. 16 January 2016. Archived from the original on 17 January 2016. Retrieved 17 January 2016. ^ Shuster, Simon (11 December 2014). "Exclusive: Gorbachev Blames the U.S. for Provoking 'New Cold War'". TIME. Archived from the original on 28 February 2016. Retrieved 25 February 2016. ^ "Russian PM Medvedev says new cold war is on". BBC News. BBC. 13 February 2016. Archived from the original on 14 February 2016. Retrieved 13 February 2016. ^ "Russian PM Medvedev equates relations with West to a 'new Cold War'". CNN. 13 February 2016. Archived from the original on 14 February 2016. Retrieved 13 February 2016. ^ "NATO chief says alliance 'does not want new Cold War'". BBC. 28 October 2016. Archived from the original on 13 April 2017. Retrieved 12 April 2017. ^ Palmer, Elizabeth (14 March 2017). "What our allies, and Putin, make of Trump's NATO ultimatum". CBS News. Archived from the original on 13 April 2017. Retrieved 12 April 2017. ^ Weber, Yuval (7 March 2016). "Are We in a Cold War or Not? 1989, 1991, and Great Power Dissatisfaction". E-International Relations. Archived from the original on 19 May 2017. Retrieved 11 June 2017. ^ Lavrov, Sergey (1 September 2016). "Foreign Minister Sergey Lavrov's remarks and answers to questions at a meeting with students and faculty at MGIMO University, Moscow, September 1, 2016". The Ministry of Foreign Affairs of the Russian Federation. Archived from the original on 9 September 2016. Retrieved 8 September 2016. ^ Osborne, Samuel (12 October 2016). "World entering era 'more dangerous than Cold War′ as Russian power grows, former MI6 boss warns". The Independent. Archived from the original on 28 October 2016. Retrieved 28 October 2016. ^ a b Labott, Elise; Gaouette, Nicole (18 October 2016). "Russia, US move past Cold War to unpredictable confrontation". CNN. Archived from the original on 28 October 2016. Retrieved 28 October 2016. ^ McKew, Molly K. (1 January 2017). "Putin's Real Long Game". Politico. Archived from the original on 14 January 2017. Retrieved 15 January 2017. ^ Heer, Jeet (4 January 2017). "A 'New Cold War' Against Russia Is a Terrible Idea". The New Republic. Archived from the original on 14 January 2017. Retrieved 15 January 2017. ^ Shapiro, Jeremy (11 January 2017). "Reordering Europe?". RealClearWorld. Archived from the original on 14 January 2017. Retrieved 15 January 2017. ^ Isachenkov, Vladimir (23 August 2017). "Russian official says US and Russia aren't in new Cold War". Associated Press. Archived from the original on 5 September 2017. Retrieved 5 September 2017. ^ Lee Yen Nee (1 March 2018). "Putin: Our new weapons 'easily' beat anti-missile systems – but this is no Cold War". CNBC. Archived from the original on 4 March 2018. Retrieved 4 March 2018. ^ Marcus, Jonathan (1 April 2018). "Russia v the West: Is this a new Cold War?". BBC News. Archived from the original on 5 April 2018. Retrieved 5 April 2018. ^ a b c Walt, Stephen M. (12 March 2018). "I Knew the Cold War. This Is No Cold War". Foreign Policy. Archived from the original on 1 August 2018. Retrieved 8 February 2019. ^ Westad, Odd Arne (27 March 2018). "Has a New Cold War Really Begun?". Foreign Affair. Archived from the original on 9 February 2019. Retrieved 9 February 2019. ^ "Syria crisis: UN chief says Cold War is back". BBC News. 13 April 2018. Archived from the original on 13 April 2018. Retrieved 13 April 2018. ^ Trenin, Dmitir (14 April 2018). "The New Cold War Is Boiling Over in Syria". BBC News. Archived from the original on 15 April 2018. Retrieved 14 April 2018. ^ Manchester, Julia. "Dem calls Russia meddling 'act of war,' urges cyber attack on Moscow banks TWEET SHARE MORE". The Hill. Archived from the original on 25 January 2019. Retrieved 16 February 2019. ^ "US nuclear weapons: first low-yield warheads roll off the production line". The Guardian. 28 January 2019. Archived from the original on 3 February 2019. Retrieved 4 February 2019. ^ a b "Lavrov predicts Cold War won't re-ignite following suspension of INF". Tass. 4 February 2019. Archived from the original on 7 February 2019. Retrieved 4 February 2019. ^ Ellyatt, Holly (7 February 2019). "Cold War has not been renewed despite breakdown of arms treaty, Russia foreign minister says". CNBC. Archived from the original on 8 February 2019. Retrieved 7 February 2019. ^ Ostroukh, Andrey; Balmforth, Tom (4 February 2019). Louise Heavens, ed. "Russia: U.S. exit from nuclear pact would not mean new Cold War – RIA". Reuters. Archived from the original on 6 February 2019. Retrieved 7 February 2019. ^ a b Jed Babbin; Edward Timperlake (2006). "Chapter One: The Next War". Showdown: Why China Wants War With the United States. Regency Publishing. ISBN 978-1596980051. ^ Gelernter, David (3 April 2009). "Welcome To Cold War II". Forbes. Archived from the original on 13 August 2017. Retrieved 25 August 2017. ^ Jagannathan, Raghavan (24 August 2011). "Is the Cold War really over? Well, Cold War II is here". Firstpost. Archived from the original on 12 April 2017. Retrieved 7 March 2016. ^ Crabtree, Justina (30 April 2018). "There's an 'undeclared new Cold War' between the US and China – and it's in tech, Australia ex-leader says". CNBC. Archived from the original on 2 May 2018. Retrieved 2 May 2018. ^ Ryan, Henry Butterfield (10 June 1999). "Another Cold War? China This Time?". Origins: Current Events in Historical Perspective. History departments at Ohio State University and Miami University. Archived from the original on 10 November 2017. Retrieved 10 November 2017. ^ Pilling, David. "US v China: is this the new cold war?". Financial Times. Archived from the original on 31 December 2015. Retrieved 16 April 2016. ^ Kor Kian Beng (22 August 2016). "China warming to new Cold War?". The Straits Times. Archived from the original on 28 October 2016. Retrieved 28 October 2016. ^ Campbell, Charlie (24 January 2017). "Donald Trump Could Be Starting a New Cold War With China. But He Has Little Chance of Winning". Time. Archived from the original on 29 January 2017. Retrieved 30 January 2017. ^ Daly, Robert (20 January 2017). "While the West Fiddles, China Races to Define the Future". Foreign Policy. Archived from the original on 2 February 2017. Retrieved 30 January 2017. The alternative is a new Cold War—one that renders all talk of global norms obsolete. ^ Talton, Jon (17 January 2017). "Will Trump start a new Cold War — with China?". The Seattle Times. Archived from the original on 2 February 2017. Retrieved 30 January 2017. ^ Minxin Pei (9 February 2017). "China Needs a New Grand Strategy". Project Syndicate. Archived from the original on 5 March 2017. Retrieved 4 March 2017. ^ "Notes from the Editors". Monthly Review. March 2017. Archived from the original on 16 March 2017. Retrieved 16 March 2017. ^ Yi Whan-woo. "China is waging a 'quiet kind of cold war' against US, top CIA expert says". CNBC. Archived from the original on 21 July 2018. Retrieved 22 July 2018. ^ Perlez, Jane (5 October 2018). "Pence's China Speech Seen as Portent of 'New Cold War'". The New York Times. Archived from the original on 2 January 2019. Retrieved 2 January 2019. (Subscription required (help)). ^ "A New Cold War Has Begun". Foreign Policy. 7 January 2019. Archived from the original on 16 January 2019. Retrieved 5 February 2019. ^ Shifrinson, Joshua (8 February 2019). "The 'new Cold War' with China is way overblown. Here's why". The Washington Post. Archived from the original on 9 February 2019. Retrieved 8 February 2019.